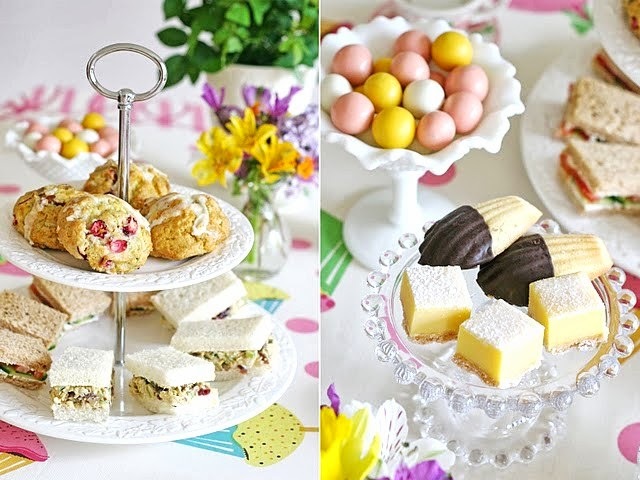 High tea on a Saturday or Sunday afternoon is all the rage nowadays. It seems as though every week my fb's newsfeed would display a high tea gathering at a fancy hotel. I'm quite surprise that no one went with a theme, like floral dresses, elegant big hats, pearls, gloves, etc. It would be fun to dress up for the event !!! in my opinion anyways ! 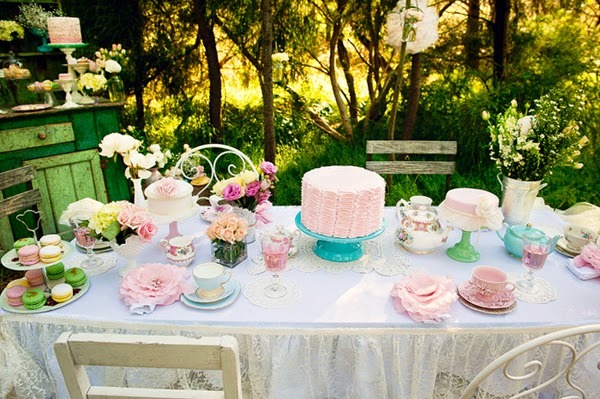 I haven't done a high tea yet but if I have the chance to, I would prefer having high tea in a garden ! with fresh flowers and all !!! I think this summer I would set up one with my girls ! 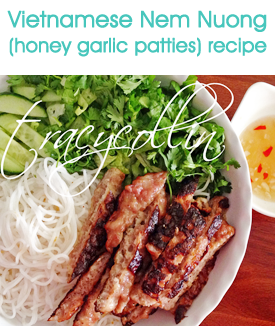 Honeybee loves to make tea. Hopefully Lovebug can sit up in her high chair by then to join us. 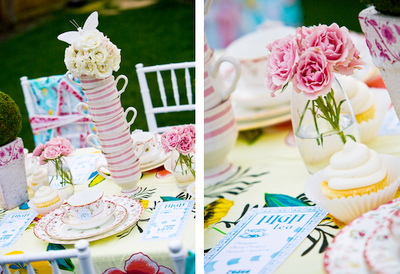 It should be easy to set up a high tea party in your garden ! there's no set rules for décor but you do need tea cups and tea pot :-) and fresh flowers ! for the food part, one must haves are finger tea sandwiches ! 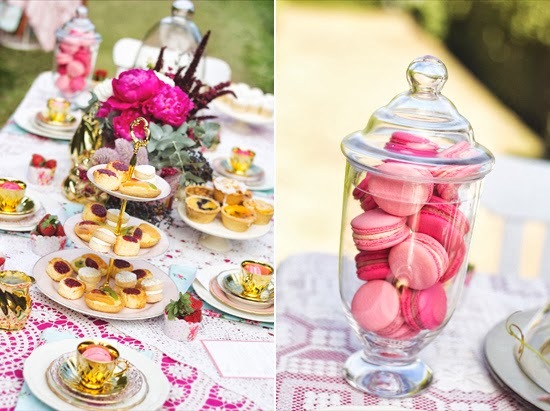 then you can add baguette rounds, cupcakes, macaroons, scones, muffin, tarts, cake, cookies, biscuits, etc., any treats that you want to have with the tea. Tomato-Cheddar: Spread mayonnaise on white bread. Sandwich with sliced tomato, aged cheddar and watercress. Trim the crusts and cut into pieces. Ham, Brie and Apple: Spread softened butter and dijon mustard inside a split loaf of French bread. Fill with deli ham, sliced brie and sliced green apple. Cut into pieces. Cucumber-Butter: Mix 4 tablespoons softened butter, 1/2 teaspoon grated lemon zest and 1 tablespoon chopped fresh herbs. Spread on white bread and sandwich with sliced cucumber. Trim the crusts and cut into pieces. Salmon-Cucumber: Spread softened cream cheese on white bread. Sandwich with smoked salmon and sliced cucumber. Trim the crusts and cut into pieces. Shrimp Salad: Mix 1 cup chopped cooked shrimp with 3 tablespoons mayonnaise, 1 teaspoon each grated lemon zest and juice, and 1 teaspoon each chopped chives, parsley and capers. Sandwich white bread with the shrimp salad and Bibb lettuce. Trim the crusts and cut into pieces. 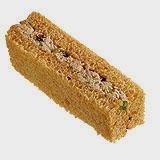 Crab Salad: Make Shrimp Salad Sandwiches (No. 12) with 1 cup crabmeat instead of shrimp. Add sliced avocado. Curried Egg Salad: Mix 3 chopped hard-boiled eggs, 3 tablespoons each chopped celery, red onion and cilantro, 2 teaspoons each dijon mustard and lime juice, and 1/4 cup mayonnaise. Cut white bread into pieces and spread with mango chutney. Sandwich with the egg salad. Pesto Chicken: Mix 2 teaspoons pesto with 2 tablespoons olive oil; brush on thin baguette rounds. Top with sliced cooked chicken breast and halved grape tomatoes. Drizzle with more pesto oil. Peanut Butter–Bacon: Spread peanut butter on white bread. Layer chopped cooked bacon and sliced banana on top. Top with bread spread with mayonnaise. Trim the crusts and cut into pieces. Prosciutto-Fig: Spread softened butter and fig jam on the inside of a split baguette. Fill with prosciutto, sliced pears and Bibb lettuce; season with salt and pepper. Cut into pieces. Salmon Salad: Combine 1 cup flaked cooked salmon, 3 tablespoons each mayonnaise, chopped chives and dill, and 1 teaspoon each dijon mustard and lemon juice. Layer the salmon salad and sliced radishes on pumpernickel bread. Trim the crusts and cut into pieces. Smoked Turkey–Apple: Brush the inside of a split baguette with softened butter. Fill with smoked turkey, cheddar cheese and sliced apple, and season with salt and pepper. Slice; top with a dollop of apple jelly. BLT: Mix 1/3 cup each mayonnaise and finely chopped cooked bacon; season with pepper. Spread on toasted white bread. Sandwich with sliced cherry tomatoes and baby greens. Trim the crusts and cut into pieces. Roasted Vegetable: Spread goat cheese on the bottom half of a split baguette and sun-dried tomato pesto on the top half. Fill with roasted eggplant and zucchini slices and roasted red pepper strips. Cut into pieces. Strawberry–Cream: Cheese Spread softened cream cheese on slices of date-nut bread and sandwich with sliced strawberries. Cut into pieces. Chicken Salad: Whisk 1/4 cup mayonnaise, 2 tablespoons each chopped shallot and tarragon, 2 teaspoons dijon mustard, and salt and pepper; stir in 1 cup shredded rotisserie chicken. Sandwich toasted white bread with the chicken salad, watercress and sliced cornichons. Trim the crusts and cut into pieces. Top with more cornichons. Cream Cheese and Jelly: Sandwich softened cream cheese and raspberry or strawberry jelly between slices of whole-wheat bread. Trim the crusts and cut into pieces. Ricotta-Orange: Cut whole-wheat bread into squares. Sandwich with fresh ricotta cheese and orange marmalade. Chocolate-Raspberry: Sandwich chocolate-hazelnut spread and seedless raspberry jam between slices of white bread. Trim the crusts and cut into pieces. 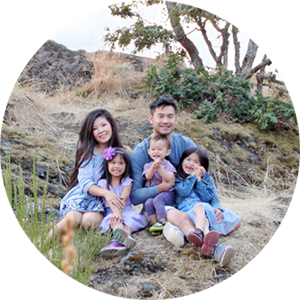 Allow 4 to 6 cut sandwich pieces per person. Choose the best-quality bread. Never serve end slices. Freezing bread before cutting and then spreading makes for easier handling. Bread should be lightly buttered no matter what the filling. Butter should be at room temperature before spreading. 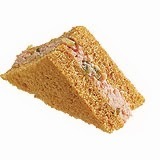 Sandwiches will not become limp and soggy as readily if you spread butter right to edge of bread. 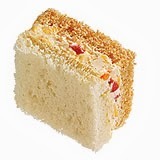 Cut crusts off bread with long, sharp knife after (not before) assembling sandwiches. This keeps everything neater. 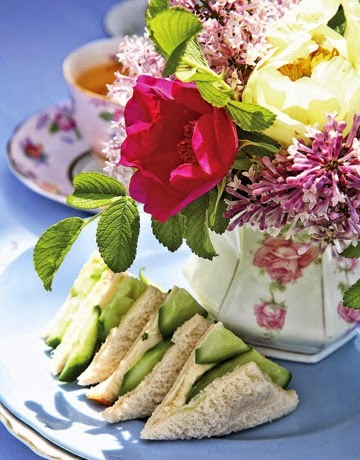 Since tea sandwiches should be delicate, cut each sandwich into thirds or quarters or in half diagonally. Or use cookie cutters to cut into decorative shapes.